Scott’s books are always very practical and full of real world examples and Real-Time Marketing and PR is no exception. Scott calls this his most important book to date and, allowing for some normal author blustering, I have to agree. This is a subject that will dominate the way businesses begin to view their world and only increase in importance as instantly becomes the new fast. As part of the research for the book Scott reached out to the top 100 of the Fortune 500 companies asking each company to explain how it had adapted to the new realities of the real-time Web. Only 28 companies responded. Surprisingly, the companies that do engage in real-time communications outperformed the S&P 500 stock index while the others underperformed the index. The research suggests the power of a real-time mindset. 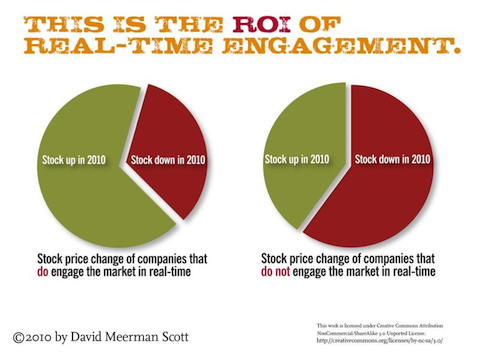 As David has done in the past, he created a free companion ebook: Real-Time: How Marketing & PR at Speed Drives Measurable Success outlining his attempts to answer how much of an effect real-time communications has on the performance of companies.